(Vatican Radio) The Director of the Holy See’s Press Office, Jesuit Father Federico Lombardi, has released a statement about the Pope’s audience with Italian disability campaigner Ileana Argentin. Please find the full statement below, in translation from the original Italian. “On Saturday morning the Holy Father received in audience Ileana Argentin, who is well-known for her efforts, achievements and expertise as a disability campaigner first with the Rome City Council and now with the Italian Parliament. The MP had sent Pope Francis a personal letter, asking to speak to him about various disability issues. The Pope promptly replied inviting her to a meeting, which took place this morning in the Apostolic Palace and lasted about half an hour. Ms. Argentin focused principally on the importance of supporting the parents of seriously disabled people, who live with great anxiety over what may happen to their children after their own deaths, and over the difficulties which their siblings may encounter in taking up the responsibility of care. The meeting also touched on other issues, such as the need to overcome barriers of accessibility to disabled people in public and Church buildings. (Vatican Radio) Pope Francis on Saturday received in audience members of the Catholic Committee for Cultural Collaboration, which celebrates its 50th anniversary this year. The audience was attended by Cardinal Kurt Koch, president of the Pontifical Council for the Promotion of Christian Unity, who provided the opening remarks. Also present were members of the management committee of the board which comprises the principle benefactors, and scholarship students who are studying in Rome. The Catholic Committee for Cultural Collaboration was established on 27 July 1964 by Pope Paul VI as one of the initiatives aimed at “reestablishing fraternal ties between the Catholic Church and the venerable Eastern Churches”. Vatican City, Jan 11, 2014 / 04:08 pm (CNA).- Pope Francis’ choices for cardinals are likely to fall in line with his pastoral emphasis and his desire that the Church go to the peripheries. In the coming days, Pope Francis will be announcing the names of those who will receive the “red hat” in the Feb. 22 consistory. Popes traditionally read out the names of the cardinals-to-be at a general audience or Sunday Angelus at least a month prior to the event. At this point, it is likely that Pope Francis will use a general audience as his platform, probably that of either Jan. 22 or 15. A “logical list” of the new cardinals would include only four created because of their function in the Roman Curia: Archbishops Pietro Parolin, Secretary of State; Gerhard Mueller, prefect of the Congregation for the Doctrine of the Faith; Beniamino Stella, prefect of the Congregation for Clergy; and Lorenzo Baldisseri, general secretary of the Synod of Bishops. Following his election as Bishop of Rome, Pope Francis gave Archbishop Baldisseri his own red biretta, traditionally a sign of things to come. At that time, Archbishop Baldisseri was serving as the conclave's secretary. Archbishop Jean-Louis Brugues, archivist of the Vatican Secret archives and librarian of Vatican Library, is not expected to be named, though the red hat customarily has come with these offices. But in choosing the new cardinals, Pope Francis may be looking to highlight the importance of peripheral Churches. That means a glance to his native Latin America, where four easy choices for the cardinalate appear. The new Latin American cardinals could be: Archbishops Mario Poli of Buenos Aires; Ricardo Ezzati Andrello of Santiago de Chile; Orani Tempesta of Rio de Janeiro, and Murilo Ramos Krieger of Sao Salvador of Bahia, in Brazil. Pope Francis may also give the red biretta to Archbishop Eustaquio Cuquejo Verga of Asuncion. Should be made a cardinal, Archbishop Cuquejo would be the first Paraguayan cardinal. The Pope is also paying a lot of attention to the Church in Asia; Fr. Federico Lombardi, director of the Holy See press office, revealed at the meeting of the association of an Italian diocesan magazine in early December that “we could expect” a papal trip to the continent in the future. The Pope’s focus on Asia would be proven by the three new Asian cardinals he may create in the next consistory. The top candidates are Archbishop Andrew Yeom Soo-jung of Seoul; Francis Xavier Kovithavanij of Bangkok; and Peter Okada of Tokyo. Africa could also get two, possibly Archbishop Odon Razanakolona of Antananarivo, in Madagascar, and Archbishop Cyprian Lwanga of Kampala. Major Archbishop Sviatoslav Shevchuk, head of the Ukrainian Greek Catholic Church, the largest of the Eastern Catholic Churches, should also get the red hat in the next consistory. Some sources maintain there will be no new cardinals from the United States, though should one be appointed, it may be Archbishop Allen Vigneron of Detroit. Those were the words of Pope Francis on Sunday, as he greeted the tens of thousands of pilgrims gathered in St. Peter’s Square for the weekly Angelus address. The Pope has adhered to the rule of 120 Cardinals under 80 years of age who will be eligible to vote in a papal election. Currently there were 13 seats “vacant”; 3 others will be “vacant” by the end of May. So the Pope has chosen 16 electors. Of the 16 eligible to vote, 4 are members of the Curia (i.e., ¼ of the total) and 12 are residential archbishops or bishops, all from different countries . The distribution of electors who are residential prelates is well distributed among the different continents: Two from Europe, three from North and Central America, three from South America, two from Africa, and two from Asia. (Vatican Radio) God’s love is good beyond comprehension: it repairs the damage caused by our sins and errors; it makes whole our personal stories after they have been broken by sin; it heals all of history. This was the focus of Pope Francis in his homily at Mass on Monday morning in the chapel of the Casa Santa Marta in the Vatican. (Vatican Radio) The names of Pope Francis’ nineteen cardinals designate were announced after last Sunday’s Angelus for the world to hear. But who are the men behind the names? The new cardinals will come from all corners of the globe and from an incredibly diverse range of ministries – we took a look at this exciting list and summarized the highlights. Part of the Holy See’s diplomatic corps since 1986, he was Apostolic Nuncio in Venezuela between 2009 and 2013, when Pope Francis nominated him Vatican Secretary of State. Previously Apostolic Nuncio in Brazil, where he welcomed Pope Benedict XVI on his visit in 2007, he was Secretary of the Congregation of Bishops from January 2012 until nominated Secretary General of the Synod of Bishops by Pope Francis in September 2013. Having graduated in philosophy and theology, he was professor of Dogmatic Theology at the Catholic Ludwig-Maximilians-Universität in Munich (Germany) between 1986 and 2002, travelling as visiting professor to universities worldwide. In 2012 Pope Benedict XVI nominated him Prefect of the Congregation for the Doctrine of the Faith, President of the Pontifical Commission “Ecclesia Dei”, President of the Pontifical Biblical Commission and President of the International Theological Commission. Part of the Holy See’s diplomatic corps since 1970, he was previously Apostolic Nuncio in Cuba and Colombia, and was nominated Prefect of the Congregation for the Clergy by Pope Francis in September 2013. The Vatican on Monday released the text of the letter Pope Francis wrote to the 19 men of the Church whom he will be elevating to the College of Cardinals in a February consistory. Pope Francis announced his decision to hold the 22 February consistory and read out the names of the Cardinals-to-be at the Sunday Angelus in St Peter’s Square. “The Cardinalate does not mean a promotion, nor an honour, nor a decoration,” the Pope writes, “it is simply a service” that calls us to “widen our gaze and enlarge the heart.” And, “although it seems a paradox,” Pope Francis observes, “this ability to see farther into the distance and love more universally with greater intensity can only be achieved by following the same way of the Lord: the way of bowing down (it. “abbassamento”) and of humility, in the manner of a servant” (cf. Phil 2:5 -8). By longstanding custom, Christmas at the Vatican is bookended by twin major speeches from the Pope – the pre-holiday message to the Curia that's become something of a "State of the Church" speech, and the New Year's greeting to the diplomatic corps accredited to the Holy See, long referred to as the "State of the World" talk. 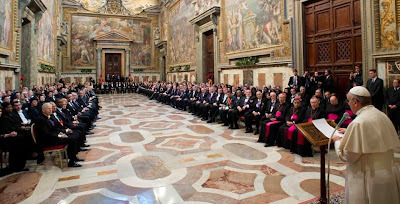 Precisely ten months after his election, Francis delivered the latter of the two today before the bulk of the 180 ambassadors for the first time. While tradition sees the address given in the grandiose Sala Regia – the frescoed upstairs "lobby" of the Apostolic Palace which links the Sistine and Pauline Chapels – the pontiff kept to his own practice of not delivering his text seated upon a throne. Even more than usual, the text is notable not just given the new pontificate and the arrival of Papa Bergoglio's own team at the Secretariat of State – led, of course, by the longtime former "foreign minister," now Cardinal-designate Pietro Parolin – but for even further pointers on how the 266th bishop of Rome (and, by extension, the worldwide diplomatic and humanitarian operations at his command) is aiming to employ both the church's standing, as well as his own, on the geopolitical front. Speaking of the global square beyond today, meanwhile, Francis has placed it squarely on the front-burner for 2014 with his confirmation last week of a 72-hour late May pilgrimage to the Holy Land, a trip which promises to be closely scrutinized for its balancing of the region's ever-fraught constituencies. Back to the "State of the World," though, following is a Vatican English translation of Francis' message this morning. “ This morning the United States Secretary of State, John Kerry met with his Vatican counterpart , Cardinal designate Pietro Parolin. This meeting was extremely important; and intensive as it lasted an hour and forty minutes. Also present at this meeting were the United States Ambassador to the Holy See and three staff members of the United State's Secretary of State. Present for the Vatican beside the Secretary of State were the Secretary for Relations with States Archbishop Mamberti and two other Curia officials versed in the related discussions. Ambassador Hackett: Kerry-Parolin meeting "very important"
(Vatican Radio) United States Secretary of State John Kerry on Tuesday met with the Holy See’s Secretary of State, Archbishop Pietro Parolin, on many issues, including the situation in Syria. The meeting looked forward to the Geneva II meeting set to begin in Switzerland on January 22 with the aim of ending the Syrian conflict. After Kerry’s meeting, the United States Ambassador to the Holy See, Kenneth Hackett, told Vatican Radio the encounter was a success. Ambassador Hackett said Secretary Kerry reiterated that violence and war are not the answer to the problems in the country. “There was no disagreement whatsoever on any of the issues on how to proceed,” he said. grace-land, I had read somewhere that His Holiness baptized a baby of an unmarried couple. Caused quite a stir as there are some priests who refuse to do so. I think he is absolutely correct. Did you read that too? I saw the headlines of various articles and read the ones with an explanation of the situation--the sources of the story seem to be two Italian articles and complicated by translation. The couple is married (civil ceremony) and "unmarried" in a Catholic marriage. If some priests have refused or delayed baptizing a baby, it might be their misunderstanding of Canon Law or there was some stumbling block with the belief of raising the child in the Catholic faith on the part of the parent/parents. However, I think that the priest should always approach this situation with great compassion and pastoral care. I agree with you, Sister, he made the right decision. He also reminded the parents of the great gift that they are giving their baby--the gift of faith. Vatican City, Jan 12, 2014 / 11:29 am (CNA/EWTN News).- During his homily at Sunday Mass, Pope Francis reminded parents who had brought their infants to be baptized of their duty to pass on the faith to their children. (Vatican Radio) Pope Francis on Wednesday reminded the faithful that through baptism we are reborn to a new life of grace and we are called to be witnesses of the Gospel before the world. Speaking to the crowds gathered in St. Peter’s Square for the weekly General Audience, the Pope continued in his catechesis on the sacrament of baptism. He reflected on how, through baptism we become members of Christ’s mystical body, the Church. “In every generation” – he said – “through baptism, we are reborn to the new life of grace and called to be witnesses of the Gospel before the world. Baptism makes us “missionary disciples” within the communion of the Church”. Here is the translation of the Holy Father’s catechesis on the Sacraments, continuing on Baptism, during today’s General Audience in St. Peter’s Square. Last Wednesday we began a brief cycle of catecheses on the Sacraments, beginning with Baptism. And I would like to reflect on Baptism also today, to underline a very important fruit of this Sacrament: it makes us become members of the Body of Christ and of the People of God. Saint Thomas Aquinas says that, whoever receives Baptism is incorporated with Christ, almost as his very member and is added to the community of the faithful (cf. Suma Theologiae, III, q. 69, art. 5; q. 70, art. 1), that is, the people of God. In the school of the Second Vatican Council, we say today that Baptism makes us enter in the People of God, it makes us become members of a People that are journeying, a pilgrim people in history.